Posted August 19th, 2013 by Ange & filed under Uncategorized. Pre-booked Pleasure Beach wristbands & it rains on the day? Fear not … if it rains for 4 hours or more on the day you visit, keep your wristband on & you will be allowed into the park next day for free! Takes some of the uncertainty out of the great British weather!! Posted August 13th, 2013 by Ange & filed under Uncategorized. A colony of about 500 Lesser Pipefish has been found in the sea at Blackpool. These tiny fish are very sensitive to water changes & are usually found in areas with a wide variety of seaweed & kelp so it is extremely unusual to find a colony living around the iron legs of Central Pier! Found during one of the monthly beach clean-ups organised by the Sealife Centre, some of the rare fish have now gone on display in the promenade attraction as they had become stranded in a rapidly vanishing pool at low tide. Posted July 24th, 2013 by Ange & filed under Uncategorized. Did you know that Blackpool zoo is wonderful … my favourite day out! As well as lots of well-cared for animals, new arrivals such as a baby zebra (Benny) & baby gorilla, it’s beautifully landscaped & best of all, flat! Do your kids love dinosaurs? 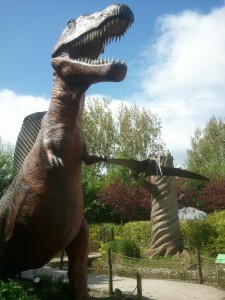 Well there’s a whole park full of them at Blackpool zoo & they’ve been re-vamped for 2013. Save your entrance ticket & you can also go into the Playbarn next door for half price. All in all a great day out. Save money with a Blackpool resort pass! Posted June 21st, 2013 by Ange & filed under Uncategorized. There is a new pass covering ALL of the major attractions in Blackpool! Valid for a week from first use, it’s perfect for an action packed weekend, short break or 2 week holiday. Each attraction can be visited once using the pass & you can plan your spending before you arrive, save loads of money, as well as save time queuing up at attractions. Save over £55 on the cost of buying tickets to these 9 attractions individually (it’s a bit like buy entry to 6 attractions & get a Pleasure Beach wristband & entry to 2 other attractions for free)! Posted May 24th, 2013 by Ange & filed under Uncategorized. Blackpool has retained its crown as the UK’s top seaside destination according to the latest Tripadvisor Travellers’ Choice Awards. Well done, Blackpool! Posted May 23rd, 2013 by Ange & filed under Uncategorized. Remember the days when you could do everything in the Tower for one, all-inclusive price? Well, buy a Tower Ticket (online or on the door) & that’s exactly what you get, saving yourself a fortune into the bargain. A Tower Ticket gives you entry to the Circus, the ballroom, Jungle Jims, the Tower Top Lift & the Dungeons … that’s 5 major attractions for just £22.50 when booking online (that’s equivalent to just £4.50 per attraction)! Never mind swimming with dolphins! Now you can swim with SHARKS at Blackpool’s Sealife Centre. Full training will be given & no experience is necessary! Get up close & personal with 20 sharks. There will be 3 sessions per day, each with a maximum of 4 snorkellers. Time in the tank will be 15 minutes but each session will last for 1.5 hours in total, including a full “behind the scenes” tour. Participation is £75, bookable online, with spectators £25. Posted May 22nd, 2013 by Ange & filed under Uncategorized. Are you planning a trip to Blackpool for a long weekend, midweek break or a Summer Holiday? If so, buy the “Big Ticket” for £40 online for BIG savings on Blackpool’s top Merlin attractions … that’s just £5.70 per attraction! (the Sealife centre alone costs £16 per person if tickets are purchased individually)! Valid for 90 days, the ticket is perfect for use over a few days. You can visit each of the 7 attractions once (I would allow about 2 hours per attraction). There’s plenty here for families with the world-famous Tower Circus which lasts for 2 hours with an interval mid-way. There are new circus performers every season joining the hilarious Mooky the Clown & his side-kick, Mr Boo & the wonderful water finale … always a great show. Then there’s Jungle Jims … an indoor adventure playground for the kids (have a coffee while the kids wear themselves out)! After that, why not take the lift up to the top of the Tower & walk on the glass floor? Plate glass windows from floor to ceiling allow extensive views across to the Lake District on a clear day. Are you brave enough? Catch your breath in the Ballroom & enjoy the live organ music, watch the dancers & wonder at the fabulous surroundings. A traditional afternoon tea is available to purchase. The final port of call in the Tower itself is the Dungeons. This attraction traces Lacashire history over the last 1000 years eg the Pendle witches. The attraction has real actors, & is funny-scary as opposed to scary-scary! There is the option of a drop-ride at the end for those who are less faint-hearted than me! Attraction number 6 is the Sealife Centre … new for 2013 is the option to snorkel with the sharks! & the ever-popular tunnel is back. Finally, there’s Mme Tussauds Waxworks to see … an interactive feast of light entertainment. Family favourites like Ant & Dec make an appearance, as well as stars of stage & screen, pop stars & prominent members of today’s Royal Family. Don’t forget your camera as you can get close to the models for some great shots of you with Cheryl, Wayne Rooney, Susan Boyle, William & Kate or your own favourite star! Posted March 30th, 2013 by Ange & filed under Uncategorized. Download the Blackpool Pleasure Beach App to your phone & you can then book same-day wristbands at a discoun. The price this weekend when booked the previous day online is £25, using the on-the-day app it’s £30 & turning up at the gate will cost you £35. Don’t forget there’s a new discounted “Resort Pass” available now for anyone who wants to visit ALL of the big Blackpool attractions. This is valid for a week so great for a long weekend or a week’s holiday! Posted March 20th, 2013 by Ange & filed under Uncategorized. The Sealife Centre in Blackpool has taken delivery of it’s latest attraction … a Giant Japanese Spider Crab called “Big Daddy” by centre staff. He has a claw span of 9 feet but they can reach the size of a mini-metro car & live up to 100 years! In the wild these crabs live off the island of Honshu (Japan) & they have become very rare because they are very tasty, apparently; indeed Big Daddy, himself, was destined for the local market. Trawling has forced them to live in the coldest, deepest waters, almost 2000 feet down. Blackpool Sealife Centre already has a smaller Japanese Spider Crab & it is hoped that the 2 will breed in the future.